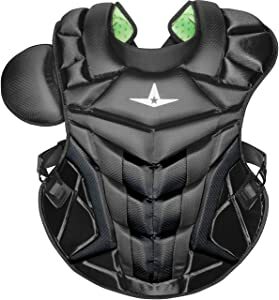 After conducting a thorough research of the market and gathering the opinions of the experts, we have shortlisted 6 best baseball chest protectors. Below are quick reviews and a look at their pros and cons. Also, if you are looking for the best catcher sets, we have included reviews for the 2 best youth catcher sets towards the end of this article. Take a look at our reviews and you are sure to find the right gear that best fits your needs. Here you go. One of the best baseball chest protectors on the market comes from All-Star. This catcher’s chest protector is specifically designed to be sturdy, flexible enough for easy wear, and durable enough to last a long time. All-Star has used stainless steel in constructing the hardware of this protector. This means that the key components of this chest protector will withstand impact, long-term usage and other forms of wear and tear. The great thing about this protector lies in the details. All-Star has used a unique design to give added strength and protection with this model. For a reduced weight and better breathability, the protector features Diamond Vents that run down the back. At the front, wedged abs make this a formidable armor with which to block effectively. The shape and design of this protector also makes it easy to wear. The overall design is breathable and flexible. The harness ensures that the gear is form-fitting and does not obstruct the wearer in any way. The Axis gear is available in a wide range of colors, virtually an endless range between black and silver. 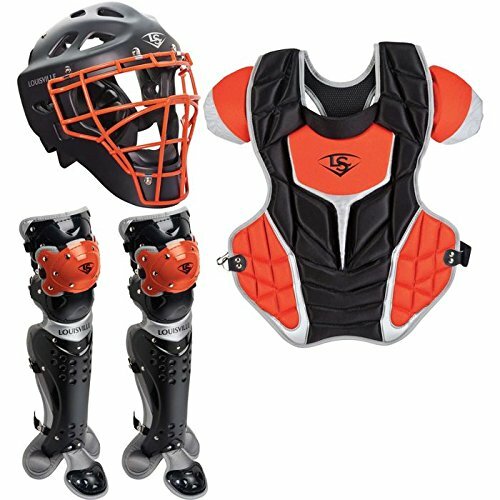 It is perfect for baseball catchers seeking to bolster body protection when on the field. Easton is a well-established and widely recognized vendor of quality baseball equipment. The company’s products are trusted across the world for their quality, reliability and performance. Although Easton is best known for its quality baseball bats, the company also produces some of the best chest protectors for baseball. A case in point is this MAKO chest protector. This brilliantly designed protector comes with a unique asymmetric structure. The asymmetric construction ensures that the protector allows the player to move naturally and freely while wearing the gear. Easton has used 4-way stretch material in making this protector. At the front, abdominal wedges provide greater protection against the incoming baseball. The wedges are designed so that they will expand and contract with the body movements without restricting the player. Another unique feature of this chest protector is the shock-absorbing foam used in its structure. In contrast to many other materials, this dense foam not only protects the body of the player but also prevents the baseball from bouncing away. As a result, the player is able to block the ball and grab it quickly at the same time. Under Armour manufactures a wide range of sports equipment and is a well-known sports brand. The company also offers quality chest protectors for baseball catchers. One of the best offered by the company is the Men’s Pro Catcher’s Chest Protector. This is a highly customizable chest protector that offers superior protection and durability. 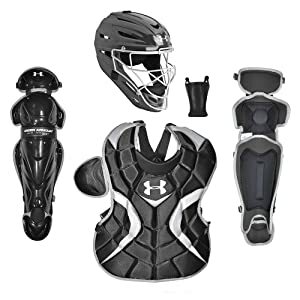 Under Armour has used its signature MPZ construction in creating this chest protector which offers full coverage and protection for the abs and shoulders. To add to the overall structural integrity of the protector, plastic insets have been placed at the shoulders, sternum and throat. The shoulder cap of the protector is fully adjustable which makes it easy for players to ensure a customized fit. The harness and straps are also fully customizable, ensuring that the protector stays in place and fits to the player’s form. 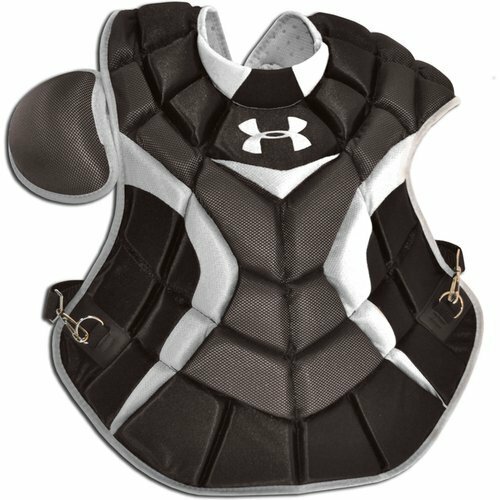 Under Armour has used HeatGear technology in this model which offers good breathability and ensures that the catcher stays cool and dry. In addition, the AEGIS microbe shield prevents the growth of bacteria or odors in the armor. At the front, low-rebound foam has been used which deadens the impact upon contact and allows the player to quickly recoup the blocked baseball. The chest protector has a four-point harness so that the catcher can easily wear, fit and use it on the field. Mizuno is another giant of the baseball manufacturing industry. The company has been around for a long while and is known for producing top-quality bats and other gear including chest protectors. Among these is the Mizuno Pro Chest Protector which combines a reliable performance with great looks. 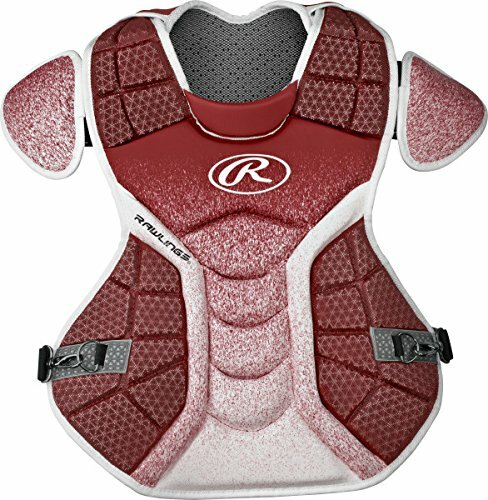 This good-looking chest protector offers sturdy protection for the baseball catchers. Mizuno has used 7-way stretch material in the construction of this chest protector. This ensures that the material remains incredibly flexible and offers free and natural movement for the players. On the inner side, the protector features DRYLITE which keeps the interior of the armour breathable and prevents the buildup of sweat or moisture. Consequently, a player stays cool and dry even when wearing this protector for many hours on end. Mizuno Pro features the iconic Mizuno protector strapping system. This system has four harness and strapping points so that the protector stays secure and stable on the player’s body. On the front, the model comes with low-rebound foam which dampens the impact of the baseball upon contact. This eliminates baseball rebound and keeps it within easily reachable distance of the player. Rawlings has garnered worldwide popularity on the basis of its world-class baseball bats. The company is now building up on that success by following it with top-of-the-range chest protectors for baseball catchers. The Velo Series Adult chest protector is one of the models currently available on the market. This model comes with ergonomically-designed front featuring AB wedges. The wedges are flat which prevent baseball rebound and ensure quick capture. Rawlings has included shoulder caps in the design of this protector. The shoulder caps are adjustable and also removable, with added protection offered on the left shoulder for the catchers. On the back, the protector features an adjustable harness system for a perfect fit. At the front, the wedges utilize impact-absorbing foam to mitigate the rebound. The overall design of this protector is very light-weight and flexible. This enables players to move freely when wearing the protector. Rawlings has used Heat Exchange foam technology in the construction of this protector. Thanks to this technology, the protector offers good airflow in the shoulders and rib areas, keeping the player cool and dry. 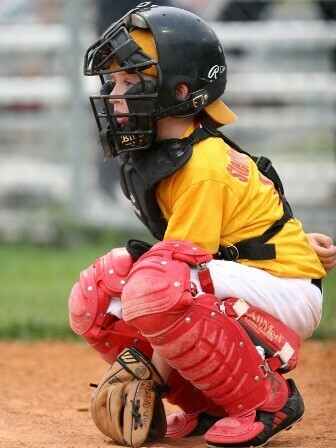 The protector is available in a wide range of colors and is specifically designed for baseball catchers. We have one of the best youth baseball chest protectors from the products offered by Easton. This is simply because the Easton line-up includes a number of quality products. The M10 chest protector from Easton is meant for intermediate catchers. It features an asymmetrical design which is particularly useful for catchers who throw with the right hand. The asymmetrical design optimizes the movement, throws and blocking of the catchers. On the front, the meticulously designed abs of the protector features zero shock memory foam. This foam effectively dampens the impact of the baseball upon contact and allows players to quickly gain control of it. 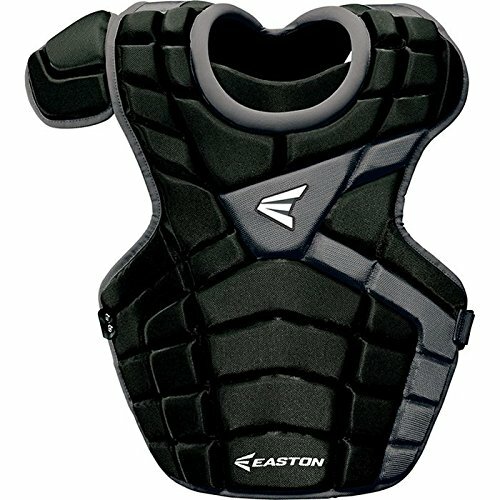 Easton has used an additional shoulder cap in this chest protector. The shoulder cap is highly effective in offering additional protection and can be easily adjusted to suit the player’s body form and style. 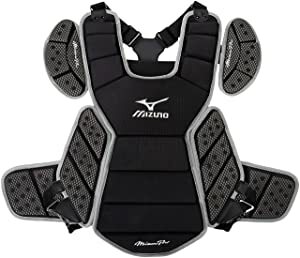 The overall design of the chest protector offers over-the-shoulder protection, shielding the catcher’s abdomen, chest and shoulders from the impact of baseball. Three-point adjustment ensures that the protector fits the player’s body very well while offering good flexibility. This chest protector is geared at players aged 13-15 years old. It is sized at 14.5 inches. When it comes to quality youth catcher sets, no list is complete without a mention of Under Armour. The PTH Victory kit from the company is one of the best catcher sets currently available on the market. This set is complete with a chest protector, leg guards and a catching helmet. The helmet features a ABS plastic shell which is very effective in absorbing the impact of baseball and deflecting it upon contact. The helmet mask uses I-Bar Vision steel cage to offer superior strength and durability. Inside, Under Armour has lined the mask with soft and breathable materials so that the players can comfortably wear the helmet for extended periods. For the chest guard, Under Armour has used quality plastic inserts at sternum, throat and shoulders to reinforce the protector’s structure. AEGIS microbe shield in the chest guard further ensures that it stays dry and cool. The chest guard is sized at 14.5 inches from sternum to naval. Leg guards measure around 13 inches from cleat to the kneecap. The kit is recommended for players aged between 9 and 12. 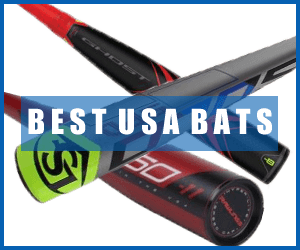 We have shortlisted another quality product from Louisville Slugger in this article. This set includes a helmet, a chest guard and shin guards. The chest guard is specifically designed for the younger players. Unlike many other youth chest guards, it doesn’t ride up when the players crouch. Instead, it fits very well to the body of the players while allowing the plenty of space and freedom for movement. Over-the-shoulder harness ensures that the chest guard stays put and fit. Louisville Slugger has used high-quality foam padding on the front of the chest guard. This ensures that there is minimal rebound from the baseball upon contact with the padding. The helmet is constructed from high-quality and durable materials. At the same time, it offers good breathability and visibility for the wearer. The shin guards are double-padded and designed to offer more flexible movement. The chest protector in this kit is sized at 12 inches. The shin guards are 13 inches in length. The set is suitable for intermediate and youth players. 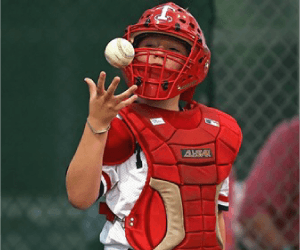 You should consider a few vital things when choosing a catcher’s chest protector. The most important things to consider include the size and the construction materials. Sizing: It is important to get a chest protector that is the right size. A protector that is too small will be stifling and won’t offer good protection. One that is too large will end up riding up or down, obstructing the player’s movement. To know your size, measure from the base of the neck to the top of the waist. This measurement is your size. If this is 13 inches, the player should get a size 13 protector. Material: Chest protectors come constructed in a variety of materials. The more sophisticated ones offer excellent protection while being soft, light-weight and flexible. The less expensive ones are slightly harder, heavier and less flexible. Choose the material that best suits your needs and budget.